As a teacher in the commission’s “Understanding Sacrifice” program, Elms was acutely cognizant that every person interred in the sponsoring agency’s cemeteries not only played a contributing role in the defense of U.S. freedoms and liberties, but also embodied a story of selfless actions and sacrifices that, if passed along to classrooms and living rooms, could simultaneously impart meaning to their respective lives and inspiration to its readership. 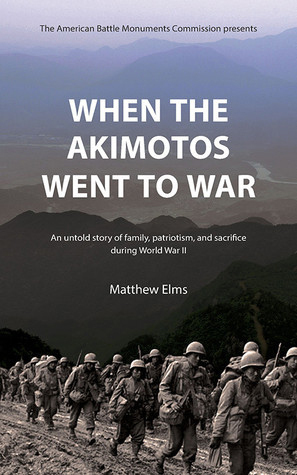 Moreover, Elms was mindful that the deaths of Nisei soldiers Johnny and Victor Akimoto, among the approximately 405,300 Americans who died in World War II, were embedded within a larger story that rendered it especially profound and poignant. After all, both of them, as well as their brother Ted, enlisted in the U.S. Army (along with more than 33,000 other Japanese Americans) and served in segregated units notwithstanding that 120,000 members of their racial-ethnic community, two-thirds of whom were U.S. citizens, were unjustly uprooted from their homes, by the U.S. government and, without due process, were incarcerated in American-style concentration camps. In his very thoughtful postscript, Elms takes pains to register for readers a critical problem that besets popular accounts of war: that too often the media, governments, and even historians “celebrate the gallantry, glamour, and courage that wars occasion,” while “failing to acknowledge the savagery of war” (p. 119). He reminds us that such glorification of war masks the reality that war is always ugly, marked by “cruel, vicious, and dehumanizing behaviors,” grisly details (such as soldiers’ bodies burned by jellied gasoline), and widespread suffering experienced on the battlefield and the homefront by individuals, families, communities and entire nations. Elms’ postscript also demythologizes the notion that “everyone in the military perishes from a single shot through the heart while undertaking a courageous deed” (p. 121). The World War II deaths of Victor Akimoto and his youngest brother Johnny are prime cases in point. Assigned to different infantry companies in the 100th Infantry Battalion, they maintained contact with one another during combat against German forces in the Battle of Anzio (January through June 1944). But on July 30, 1944, Johnny checked into a military field hospital in Italy and was diagnosed with acute hepatitis from an unknown source. Two days later, he slipped into a coma, and the following day, he died. As for Victor, after the liberation of Rome via the Battle of Anzio, he was assigned (along with the rest of the 100th Infantry Battalion) to the 442nd Regimental Combat Team and fought in a series of other battles in Italy. By October 1944, the 442nd troops were deployed in France in the Vosges Mountains region and ordered to rescue the 141st Infantry Regiment, comprised mostly of Texans, the so-called Lost Battalion. It required by Oct. 30, 1944, a combined total of 800 casualties, deaths, and injuries of the 442nd to save the 141st soldiers. But during this sacrificial mission of mercy, the German army captured many Japanese American combatants, including Victor Akimoto, who had suffered a shattered thigh bone from enemy fire. Transported by truck to a prisoner of war camp in Germany, his condition worsened due to a lack of antibiotics and proper sterilization procedures, his infected wound turned to gangrene, and this development led to his leg being amputated. He then refused to eat, and died Dec. 14, 1944. Both Johnny and Victor Akimoto were eventually buried at France’s Lorraine American Cemetery. Their Issei father, Masanori Akimoto, died in 1951, having never visited their graveyard, but fortunately, their Issei mother, Mary Akimoto, accompanied by her Nisei son, Ted Akimoto, was able in 1960 to travel to that distant burial site and gain a measure of closure for her grieving heart. Although When the Akimotos Went to War is beautifully written, well researched, adorned with a variety of illustrations and maps, and includes a useful bibliography, the book suffers from an awkward, if artful, organization, that makes it somewhat challenging to traverse. *This article was originally published by Nichi Bei Weekly on January 1, 2019.